Rhubarb is in season!! It has a short season and I can only find it in the market for a few weeks. A bit longer at farmer's markets, but the gorgeous, pink celery-looking goodness goes quickly. I am sort of obsessed with rhubarb, the color, the flavor, the fact it looks like pink celery, everything! A few years ago I found this recipe, made it with a dear friend, I fell in love with it and now I look forward to it every year! 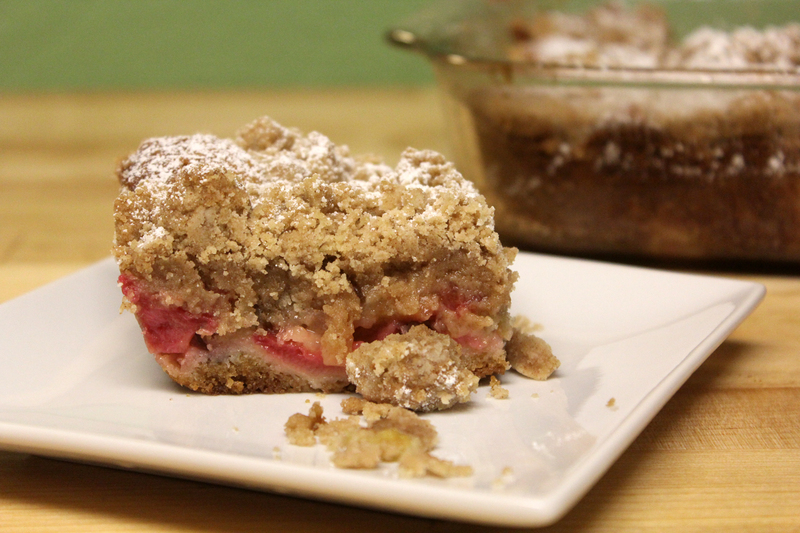 This coffee cake is wild - it has a huge crumb topping and the rhubarb melts into the cake. It's not overly sweet, but it's very rich and really delicious. The original recipe only makes an 8x8 pan, but given the complexity, steps involved and fleeting nature of rhubarb, I have doubled things up to make a 9x13 pan. I had a cake helper! 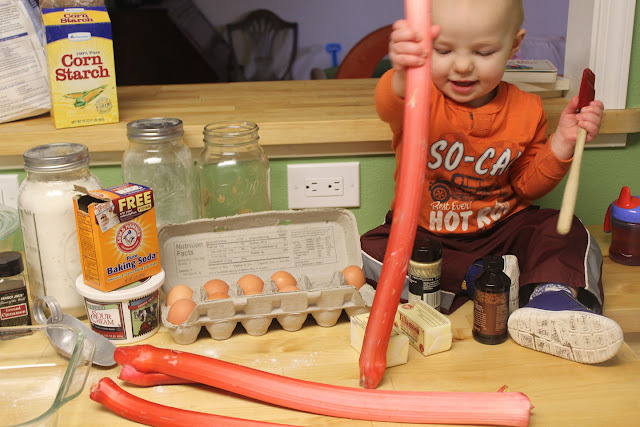 Cut rhubarb into 1/2 inch chunks. In a mixing bowl, combine with sugar, cornstarch and ginger. Set aside. To make the crumb topping, in another mixing bowl combine the sugars, cinnamon, ginger and salt. Then mix in the melted butter. After that, mix in the flour with a spatula until a thick dough is formed. It will be REALLY thick, don't worry. Set aside. 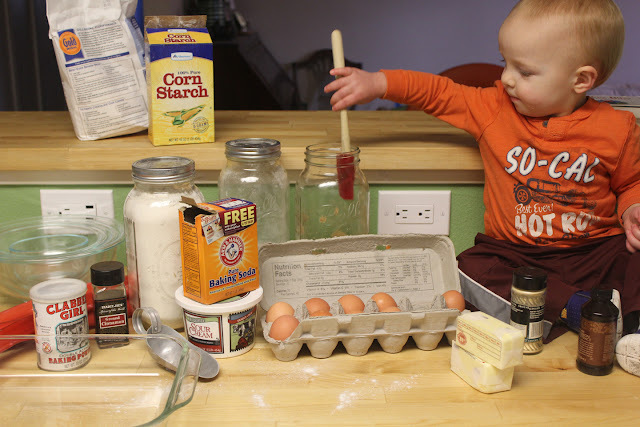 To make the cake, in another mixing bowl, combine sour cream, eggs, yolk and vanilla. Stir to combine and set aside. In a last and final bowl, combine the flour, sugar, baking soda, baking powder and salt. I used a stand mixer to finish up the cake... mix the flour, sugar, baking soda, baking powder and salt until all combined. Mix in the softened butter and a spoonful of the sour cream mixture and mix on medium until the flour is moistened. Add the remaining sour cream mixture in two batches. Beat for 20 seconds after each time you add the mixture. Set aside 1/2 a cup of batter. Pour the batter into the prepared baking pan (except for the 1/2 cup you have reserved.) Layer on the rhubarb that has been marinating, scrape all of the juices out of the bowl. Dollop on the remaining batter - it won't be even, but that's OK. Break up the crumb topping and spread over the cake batter. Leave big crumbs - there will be a ton of crumb topping!! Bake for 45-55 minutes at 325. A toothpick inserted in the middle of the cake should come out with just a few small crumbs sticking to it, it may look really moist, but that might be the rhubarb. The cake shouldn't look wobbly in the middle when its done. Once cooled, sprinkle with powdered sugar and serve. Smitten Kitchen says that this recipe would be good with a variety of other fruits - I plan to try it this summer with blueberries and/or cherries! Next time I make this, I will not reserve the 1/2 cup of batter to dollop over the top. Instead I will put all of the batter on the bottom of the pan, and then I'll lightly press the rhubarb into the batter so that it "sticks" before I put on the crumb topping. I made this coffee cake on Sunday evening and brought it to work with me on Monday morning. It kept really well and was nice and moist everyone at worked seemed to like it. Since it is a bit involved to make, I would definitely make this the night before for a brunch.